Several Cars Reported Missing During Inaugural Singapore F1 Race. The much anticipated inaugural Singapore Formula-1 race kicked off with much fanfare and was a resounding success with Jenson Button taking the first ever Singapore chequered flag. However, there were a few mishaps that marred the event, without which, could have been touted as the perfect event of the year. Several cars did not return to the paddock after the race was over and the police have since launched a island-wide for these cars. 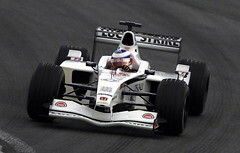 The missings cars belong to Takuma Sato, Jarno Trulli as well as the Brazilian pair of Felipe Massa and Reubens Barrichello. All four cars and their respective drivers were subsequently found six hours later. Below are their individual reports. 1) Felipe Massa was found circling in the Toa Payoh estate disoriented and dehydrated. "I took a wrong exit into this place by I just couldn't find a way out of the estate. I kept going in circles and loops. It was hell when all the street names looked the same! ", said Felipe Massa. "I do not know what is Lorong 2 or Lorong 4 or even what is a Lorong? It also did not appear that Street 31 will lead to Street 32." He added. "I even tried to follow the block numbers hoping that there is an exit at Block 1!" 2) Reubens Barrichello was found sitting by the pavement next to his car at Marine Parade. The police also observed that the car was dangling over a road hump at Marine Vista. It looked apparently that the low clearance of the race car's chassis could not clear the road humps. "My god! 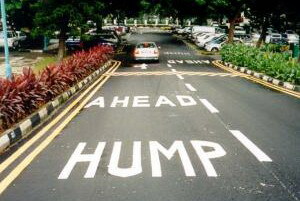 The humps are too high in this part of Singapore!" exclaimed a visibly distressed Barrichello. 3) Not all were upset as Jarno Trulli did make light of the bad situation as he was found signing autographs for the local fans and enjoying a hearty breakfast of the local coffee and kaya bread, when the police finally caught up. "My map says Siglap Road but it says Killiney Road* here." said Trulli. "I knew I was a goner and decided to give up." * Trulli was refering to the Killiney Road Kaya Toast branch outlet on Siglap Road. 4) It seems that Takuma Sato had it worst of the four missing drivers as he was detained at the Malaysian immigration checkpoint in Johor without a passport and a valid visa. "Ah nor.. Singapore is too small i-ne! I miss one exit and I am in Malaysia!" said the Japanese driver. At press time, the Japanese High Commission is still in discussion with their Malaysian counterpart regarding the release of Sato. Zeenie: Hey man! Good to hear from you again! Glad to know you enjoyed reading it as much as I enjoyed writing it. Originally, I also wanted to add in the joke about Cash Card and IU but I realised that I already did that back in Apr 2005 (Read Here) and mrbrown also joked about it in his recent podcast (Click Here). HiaoAunty: I figured that you probably haven't gotten round to hooking up your broadband at your new place. Was just about to sms you to see how you're doing. Anyway, the article is indeed fake (note the date of the article) and is 100% genuine orgeeginal creation of yours truly.